A bespoke Lexus design concept will be positioned at the heart of an exclusive installation, using special mirrors to generate unexpected reflections and illumination to create a flow of motion stimulating the imagination. 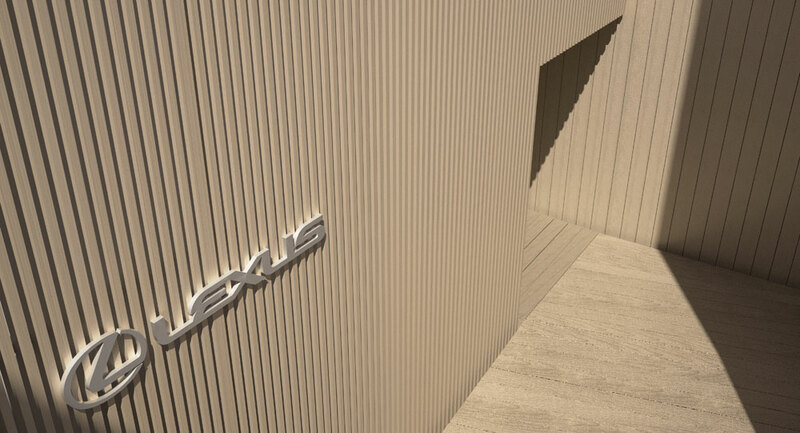 Created by the company’s Europe-based design studio, ED², this concept is a perfect illustration of Lexus’ passion for upcoming design trends. Visitors will be invited to successively explore three cocoons constructed of an intricate wooden lattice work. The cocoons will create a primal environment in which visitors will be able to savour the work of food designer Hajime Yoneda as they move progressively forward on a sensory journey into the Lexus brand experience. In the first cocoon, visitors will be given a rain flakes and ushered into a darkened room to experience the feeling and sound of falling rain. Hand-crafted chocolate will be given to visitors as they will enter the second room to sense the smells, the sounds and the taste of a forest from the inside-out. Finally, visitors will be given a bowl of ‘Earth Soup’ before entering a beautiful universe with stars twinkling in the darkness – symbolising the life force of mother earth. Sounds like a pretty wild party! A Journey of the Senses will be open to the public from Tuesday, April 14 to Sunday, April 19 from 11 AM to 9 PM at Lexus Spazio – La Torneria, Via Tortona 32, Milan. A press preview will be held on Monday April 13 from 10 AM to 6 PM. Daniel Guyton: I wish I could go. It would be an awesome birthday gift.